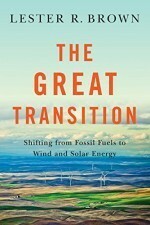 The Great Transition details the accelerating pace of this global energy revolution. As many countries become less enamored with coal and nuclear power, they are embracing an array of clean, renewable energies. Whereas solar energy projects were once small-scale, largely designed for residential use, energy investors are now building utility-scale solar projects. Strides are being made: some of the huge wind farm complexes under construction in China will each produce as much electricity as several nuclear power plants, and an electrified transport system supplemented by the use of bicycles could reshape the way we think about mobility. Download the book here. Energy in America is undergoing a period of rapid change, driven by new technologies, consumer empowerment, and the imperative to reduce emissions that cause global warming. But people who want to save energy or install solar panels are finding their efforts are at odds with utilities seeking to preserve their profits. Seeing an existential threat to their business model, utilities across the country are pursuing policy changes that will make it less viable for customers to generate their own electricity. Impatient with the slow pace of change at the state level, an increasing number of cities — such as Boulder, Minneapolis and Madison — are taking matters into their own hands as their citizens seek energy that is local, affordable, and clean. 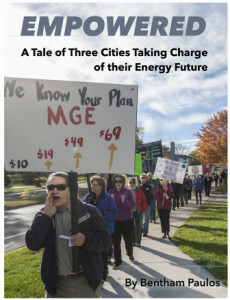 Empowered describes how city officials and activists in Boulder, Minneapolis, and Madison are fighting back against entrenched utilities, and taking charge of their energy future. Download free PDF here. Can be read online, or uploaded to Kindle and other devices. Click here to subscribe to Midwest Energy News’ daily headlines sent by email. This entry was posted in NewsBlog and tagged Empowered, free books, free books on renewable energy, global energy transition, Midwest Energy News, policies that facilitate renewable energy, The Great Transition on September 30, 2015 by Helen Deffenbacher.